Comments like these can be found from passionate (but ultimately naive) fans all over social media. It’s safe to say that the entire gaming community can get behind comments like the one above. After all, who doesn’t want more a more immersive and complete Madden 19, FIFA 19, or NHL 19? To be sure, developing a blockbuster game in less than a year is a difficult challenge. There’s no question about that. We often hear that as an excuse as to why these games can’t be more complete or better. Another common refrain is that if only the employees at EA in charge of making the game would just listen to fans, we’d have much better games. In this article, I posit that these things have nothing to do with why we often get what feels like unfinished games at release. To understand why, you must get your head around the inner working of corporate EA. I realize that reading confusing financial statements and lengthy conference calls may not be your idea of a great time but it is something that must be done in order to get to the truth. Simply put, everything comes down to financials. In the article below, I’ll attempt to translate the executive speak and detailed spreadsheets to explain why many longtime favorite games like Madden 19 and FIFA 19 are no longer getting the resources to develop for the future. Let’s first take a look at an earnings slide from EA’s most recent report and make sure you understand what everything means. All of the above numbers are in millions so if it says (355) that means ($355 million dollars). 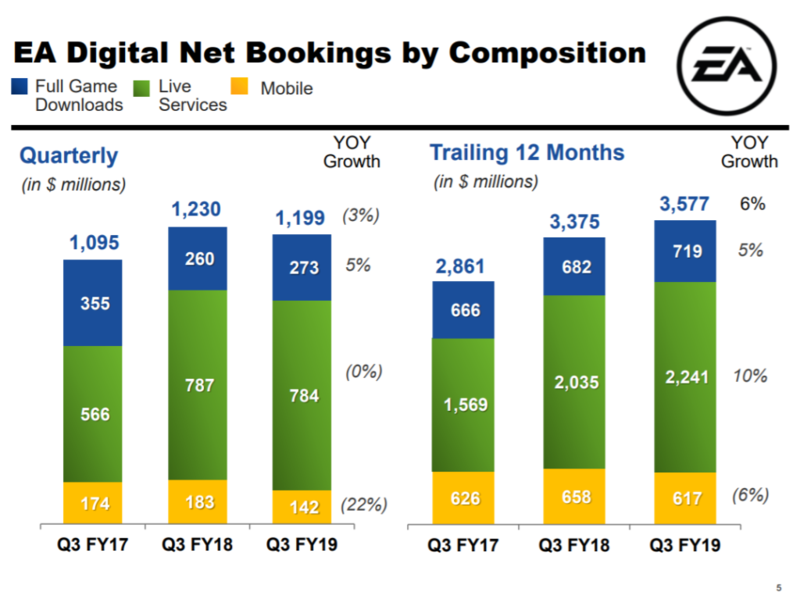 The above chart looks at digital net bookings. For our purposes we will treat digital net bookings as revenue. Although there are some minor differences between net bookings and revenue, in the long run they should be very similar numbers. For those of you interested, net bookings is basically a commitment from a customer to order an item while revenue is money they have actually received. The main difference here is likely pre-orders that haven’t yet been paid for. Full game downloads is comprised of all digital purchases of video games (not from a brick and mortar store like Gamestop or Walmart). Live services is basically “Ultimate Team” or similar things in other games. Mobile is pretty self explanatory but it is the part of EA’s business that develops apps for smart phones. Think of mobile games like Madden Overdrive or Fifa Soccer. We’ll ignore mobile in this article since it does not relate to what we are covering. On the left side of the image you have results for the last 3 months of 2018. October, November, December. Those months are what EA calls their Q3 quarter. So the left side basically shows how sales were distributed in October/November/December 2016, October/November/December/ 2017 and October/November/December 2018. On the right side of the image, you have results for the full years of 2016, 2017, and 2018. That includes January-December instead of just the last 3 months of the year. The blue area represents digital sales but as we know, many people purchase from retail locations. However, retail sales of video games have been plummeting over the past few years with no end in sight. For our purposes here, we will double the amount of digital game sales to get close to a ballpark of total game sales. That comes in about right as EA reported on February 5th, 2019 that total “product” sales for the quarter came in at $552 million. If we look at Q3 FY19 digital game downloads in the screenshot above, we can see that they reported $273 million. If we double that, it takes us to $546 million which is right in line with our estimates. So let’s compare where all of EA’s growth is coming from. If we look at Q3 FY17 digital game sales, we see it was responsible for $355 million. 2 years later, digital game sales are responsible for $273 million. That is an over 30% drop in 2 years or about 15% per year. That is even with the overwhelmingly strong trends of more gamers digitally downloading their games. To put it a different way, in 2016 a larger percentage of people went to a retail store to buy games than they did in 2018. That trend is expected to continue well into the future. Factoring that in leads the numbers to be even more overwhelming. Staying on the left side of the image above, we can see that in October/November/December 2016 EA’s live services (read: Ultimate Team) had net bookings of $566 million. By the October/November/December quarter of 2018, that number had grown to $784 million. That’s about a 39% increase in 2 years time or almost 20% per year growth. The same thing can be seen as we move to the right side of the screenshot above looking at full year 2016, 2017, and 2018 results. EA took in $666 million in games sales for the year 2016 and in 2018 took in $719 million. That’s a very meager 8% over 2 years or 4% per year growth. If we turn our attention to the “Live Services” or Ultimate Team growth we went from $1,569 million (or 1.56 billion) to 2,241 million or (2.24 billion) in the same 2 years. That is growth of 44% over 2 years or 22% per year on average. That is also starting from a much higher base number. EA is to the point where they are making nearly twice as much in revenue on Live services like Ultimate Team as they are on the games themselves and that number is growing every year. It doesn’t stop their though. Keep in mind we are looking at revenue not profits. How much do you estimate it costs to develop a AAA game? Now how much do you estimate it costs to acquire the rights and make cards for 100 previous sports stars? The first one is extremely expensive. The 2nd one is basically a rounding error. To compare this to every day life for you and me, it would be as if EA approaches you personally with 2 business opportunities. You could invest $100,000 into attempting to fix an annoying glitch in your favorite game with just a hope that it somehow translates into you getting your money back. Which one are you doing? That is the choice that EA management has been presented with. They have a duty to their shareholders to allocate capital and resources to the place that will maximize their profits. EA has the legacy part of their business growing very slowly (if at all) with very low profit margins. They also have a new/exciting part of their business (from an investor perspective) with enormous profit margins. It only makes sense for them to put a disproportionate amount of their resources focusing there. The issue that they are overlooking is that the entire Live Services business model is dependent on game sales. Gameplay must be good, new features must be added otherwise they risk losing out on Live Services revenue. EA is prioritizing short term profits over the long term health of their business. Wall Street has started to take notice, with EA’s stock falling nearly 50% from it’s highs in just 6 months. The solution must be a happy medium where they invest to keep players engaged with their core games while continuing to push Ultimate Team and other digital add-ons. It isn’t what we as gamers would like to hear but it is an unavoidable truth. Expect the trend of under-investing in features and gameplay to continue for some time. If you liked this post, check out our previous article on EA’s Pay to Win system and DDA. 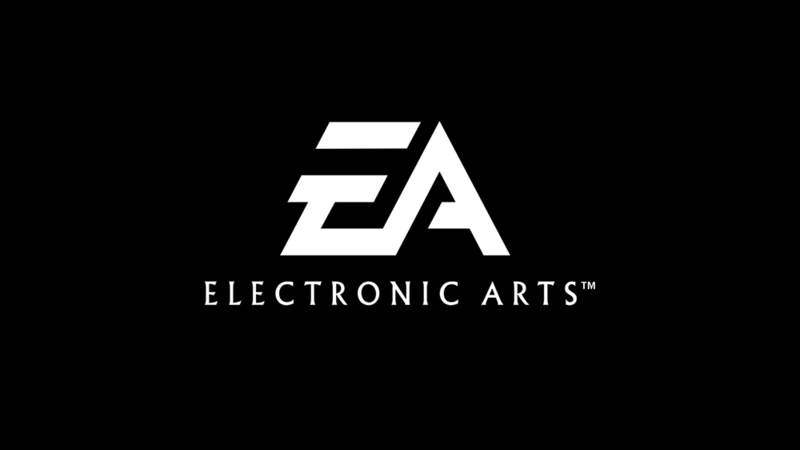 Make sure to give us a follow on Twitter @stickskills as we will be continuing our in-depth series focusing on Electronic Arts every week.